Golden Bayon Express is Cambodia mini-bus company that goes to a few cities, but their Phnom Penh to Siem Reap route is their most popular. If you’re looking for the quickest way to get between Phnom Penh and Siem Reap (other than flying, of course), a mini-bus is the fastest, albeit bumpiest, way to go. Golden Bayon Express does the trip in just around six hours, and when the roads aren’t so bad they claim to do it in five. 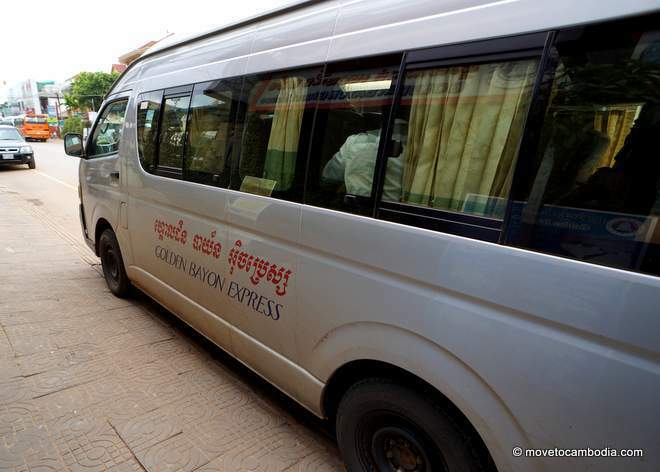 Golden Bayon Express: A long six hours to get from Phnom Penh to Siem Reap. Golden Bayon Express has a fleet of 15-seat Toyota HiAce, that are similar (but not as nice) to their competitor Elephant Express. These are certainly the most comfortable of all of the current mini-bus types currently on the road in Cambodia, with larger padded seats than the Ford Transits. Golden Bayon Express claims their HiAces are from 2012, and if that’s the case, they have had a long, hard two years. The interiors are dingy, with holes in the upholstery and stains on the ceilings. Book your seat in advance if you don’t want to end up in the back row (and trust me, you don’t want to end up in the back row). Seat 1 is next to the driver and is not ideal. Seat 2 is “shotgun,” but you’ll have someone between you and the driver. Seats 3, 4, and 5 are the first row. Seats 6 and 7 are the second row, and are the best seats for a couple. Seat 8 is a solo seat on the same row, and has the most legroom on the bus. The third row has another pair of seats, 9 and 10, and another solo seat, 11. The last row, with seats 12, 13, 14, and 15 is cramped and I’d only marginally prefer riding in one of them to walking. Golden Bayon Express HiAce. Comfy seats, grim interiors. Buses run from Phnom Penh to Siem Reap at: 7:30 a.m., 8:15 a.m., 2:00 p.m., 3:00 p.m. Buses run from Siem Reap to Phnom Penh at: 7:30 a.m., 8:15 a.m., 2:00 p.m., 3:00 p.m.
Golden Bayon Express is yet another Cambodian transport company that has one price for Cambodians ($8) and one price for foreigners ($10). As per usual, I find this irritating, and I don’t particularly like giving my money to companies that businesses that have prices based on race (just looking Asian is usually enough to get the local price, but a white face speaking Khmer will still get the foreigner rate). Arguing about it at their office will sometimes bring the price down to $9, or, you can buy a ticket online with advance seat reservation for $10 plus a $1 processing fee. To compound the offence, Golden Bayon Express’ mid-way stopping point between Siem Reap and Phnom Penh is at the Arunas Hotel restaurant in Kampong Thom, which is notorious for having one set of prices for foreigners and another for Cambodians. For tourists, this is perhaps not such an issue, but for disgruntled expats like myself, it’s really, really, annoying. 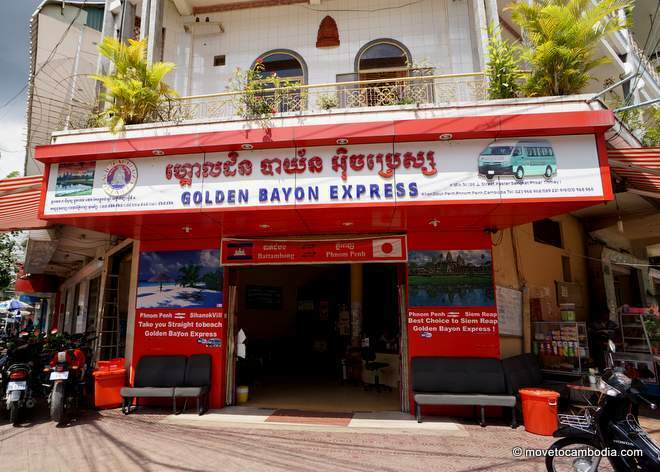 Golden Bayon Express promises free WiFi on the Phnom Penh to Siem Reap route, but when I asked in the office the staff laughed and said “ask the driver.” Once on the mini-bus I realized why they were laughing; the router wasn’t plugged in and was covered in dust. There may have once been WiFi, but no more. 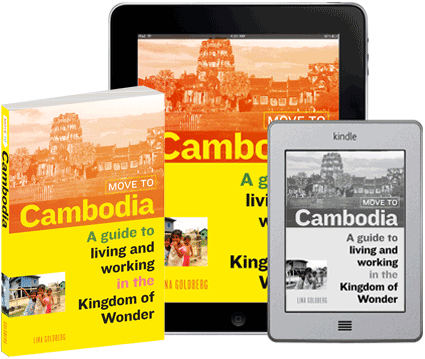 The bus stopped three times, two for short bathroom breaks and once for a longer break in Kampong Thom. The stop is right next to the market and there are lots of street food options, so if you’re feeling adventurous, it’s a better option that the aforementioned Arunas Hotel. In total, my trip took just over six hours. The road between Phnom Penh and Siem Reap is awful right now, there are long stretches where it’s not paved and the drivers just speed over the bumps in a stomach-churning sort of way. There’s no way to pretend that the Golden Bayon Express drivers are concerned about safety. In general, the mini-buses have two things over Giant Ibis, they’re faster and cheaper. But with the roads in such shoddy condition, Giant Ibis still has the edge; they charge the same price to everyone and although the trip takes longer, it’s more comfortable, less bumpy, and significantly safer. If you’re dead set on a mini-bus, I’d take Seila Angkor or Elephant Express. In conclusion, the trip wasn’t particularly bad, and maybe I’m just getting grumpy from spending so much time on mini-buses, but I wasn’t impressed by Golden Bayon Express. Bus tickets purchased through links in this post to read more here. 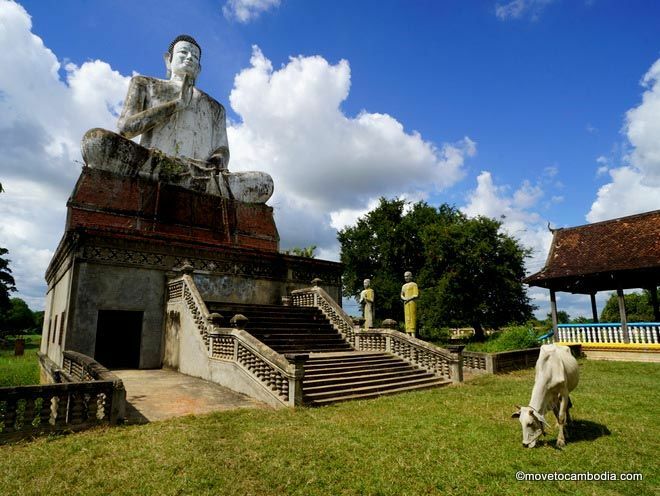 This entry was posted in Transportation and tagged Phnom Penh to Siem Reap, Siem Reap to Phnom Penh, Phnom Penh Siem Reap mini-buses, Golden Bayon Express, Cambodia mini-buses. Bookmark the permalink. I just want to leave a message because this is too funny. Nonetheless this is a great review, it is enjoyable reading your post, even reviews on bus services! What would be a round trip fare for 11 passengers between Phnom Penh and Sihanoukville? We would like to leave Phnom Penh to Sihanoukville early in the morining on 9/3/2016 and return to Phnom Penh on 9/4/2016 by night.Thank you for your input! The price is in the post. Could you not multiply it by 11, then multiply it by 2 (for the return trip)? Is there something I am missing here?